If you live in Minnesota, likely you’re aware that we’re marking the 150th anniversary of the U.S.-Dakota Conflict. If you don’t live in Minnesota, you might not be aware of this somber chapter of our history. At the time, the Civil War was capturing the nation’s attention, and does to this day. 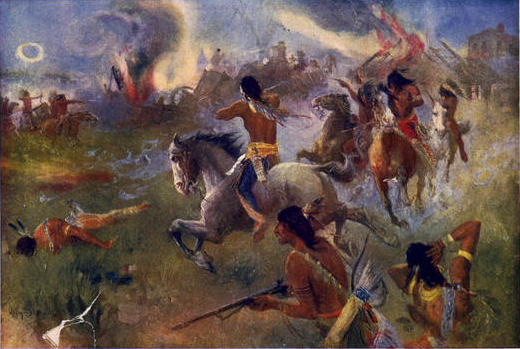 While the fighting was going on between the North and the South, battles between Native Americans and settlers raged on the Minnesota prairie. For highly informative and well-written chronologies of the conflict, see reports in The Mankato Free Press and Minneapolis StarTribune (e-book available). Also, check out this book by Gwen Westerman and Bruce White called Mni Sota Makoce. Yes, they skipped this when I was in school also!!! Hi Rachael, it’s amazing how little is known about this history. I LIVED there and hadn’t heard of it until college. And outside MN, hardly anyone has ever heard of it. Maybe your post will raise awareness; I hope so. I mention your name in a post I have scheduled for next weekend. Would you like me to link to your blog, or to your home page? The U.S.-Dakota Conflict is a great example of one of those regional battles that generally does not get known outside of the region. Only die-hard trivia buffs know that Mankato is the site of the largest mass execution in U.S. history–the hanging of 38 Native Americans after the Conflict. If you want to link to my blog, that would be great! I’d like to eventually move all info from my website over to my blog site. Done. It’s posting on the 25th. Thanks for the links to those articles. I read “Over the Earth I Come – the Great Sioux Uprising of 1862” by Duane Schultz many years ago. You can borrow if you want. It’s a gorgeous tribute, haunts me still. I have some Native American flute music I’ll put on the stereo in honor of the anniversary, too. Sounds like a great book. One of my favorite on the entire “Indian Wars” of the Plains states is BURY MY HEART AT WOUNDED KNEE. I didn’t see the HBO movie of the same name yet. Hey, Rachael, I’m now an official subscriber to your blog! I don’t know if I’ll get to read it all the time, but I hope to. I want to ask you something about your use of the word “anniversary.” Since it’s a somber time, just like any day that is tragic or horrible, why do we use the word “anniversary”? Wouldn’t you think that connotation to be more joyful? For example, I’m about to celebrate my 20th wedding anniversary. I still like my husband 90% of the time (love him 100% of the time, of course), so my marriage is happy and joyful. A reason to celebrate. But Dec. 21 is the date of my dad’s death. This year (the day the world is supposed to end), it will mark the 40th year of his death. But I refuse to call it an “anniversary.” What do you think? And congratulations on nearing your 20-year mark! !